Data Detour: What Is the Nature of the Data You Will Be Using? Create and name the procedure and select the tool you will use to create the report. If it is not already open, expand the FINANCIAL project folder. Click the Procedures folder. Since you will not be using any of the sample procedures in this project, click the binoculars icon to empty the active box. Right-click the Procedures folder and choose New, and then Procedure. 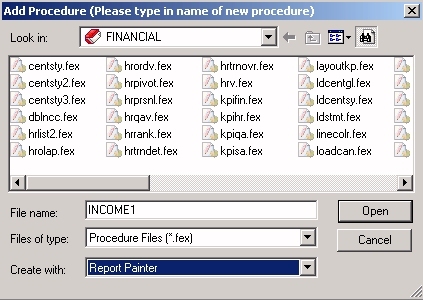 Name the procedure INCOME1 and choose Report Painter from the Create with drop-down list. Before Report Painter opens, the Open dialog box asks you to specify the data source you will be using to create your report. Report Painter opens. The Object Inspector displays the fields in the CENTSTMT data source. Before adding fields to the report, detour again to look more closely at the structure of the data in CENTSTMT.MAS. Proceed to Data Detour: What Is the Nature of the Data You Will Be Using?. SEGNAME=ACCOUNTS defines a chart of accounts hierarchy. The field GL_ACCOUNT_PARENT is the parent field in the hierarchy. The field GL_ACCOUNT is the hierarchy field. The field GL_ACCOUNT_CAPTION can be used as the descriptive caption for the hierarchy field. The hierarchy will come into play in the second part of this tutorial, when you begin to structure the income statement in the Financial Report Painter. SEGNAME=CONSOL contains financial data structured as a data mart in which detailed data has already been rolled up to optimize reporting. 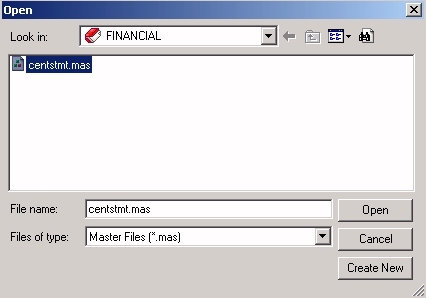 Tip: If you want to examine the Master File in Developer Studio, you can expand the Master Files folder in the FINANCIAL project, right-click CENTSTMT.MAS, and choose Edit in Text Editor to see the representation shown here. Alternatively, you can double-click CENTSTMT.MAS to open the file in the Synonym Editor, where you can select each field to see how its attributes have been defined. For details, see Describing Data for an FML Hierarchy.